If you're like most marketers, you're always on the search for ways to reach new audiences and generate leads. But did you know that according to BrightTALK, 80% of marketers report their current lead generation efforts are only slightly or somewhat effective? Typically, lead generation marketers collect information through form submissions on a website. First, the marketer promotes a specific offer -- like a gated ebook or coupon -- and then an interested user will fill out a lead form to claim the offer. While this method does work and helps get exposure to your site, it has one important problem: it requires users to leave the place where the offer was promoted to click through your conversion path. For marketers, this means bounce-rates at every point along the process. And that's not ideal. Ever wish you could just reach people and collect information from them without asking them leave the social network they're already browsing? Well, you can -- with Facebook Lead Ads. 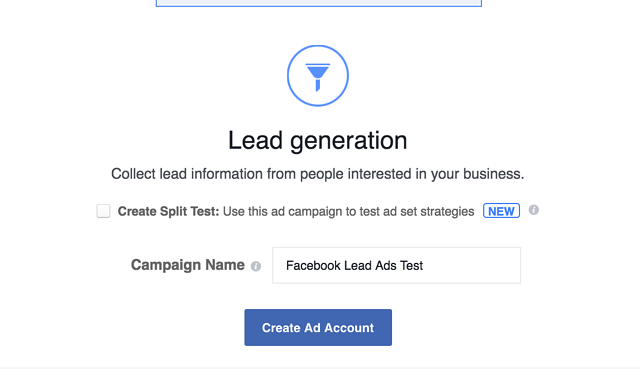 In this article, we'll go over the basics of Facebook lead ads: what they are, why they matter, and how you can start using them effectively in your own marketing campaigns. 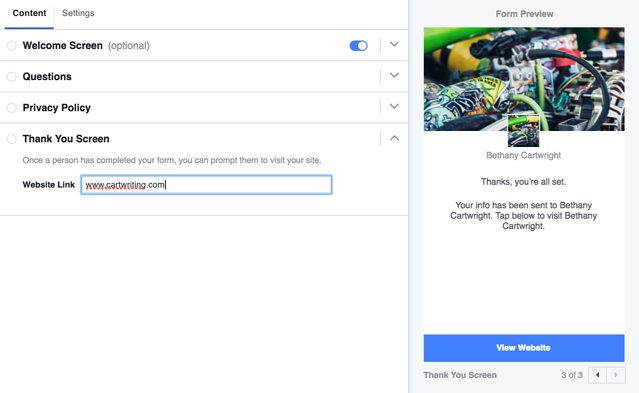 This feature means you can capture lead information from the Facebook platform and avoid the friction of a longer click-through path for the user. 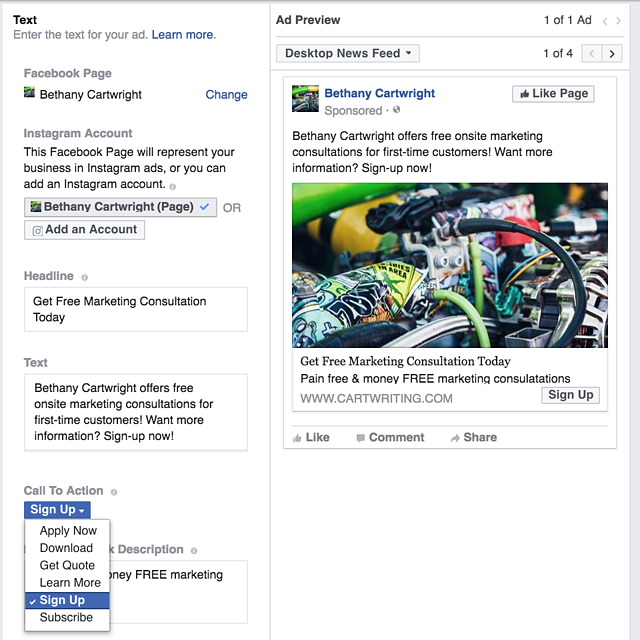 Facebook lead ads allow prospects to sign up for your offers or request other types of offers -- such as pricing guides, product demos, or free trials -- directly within the Facebook platform. 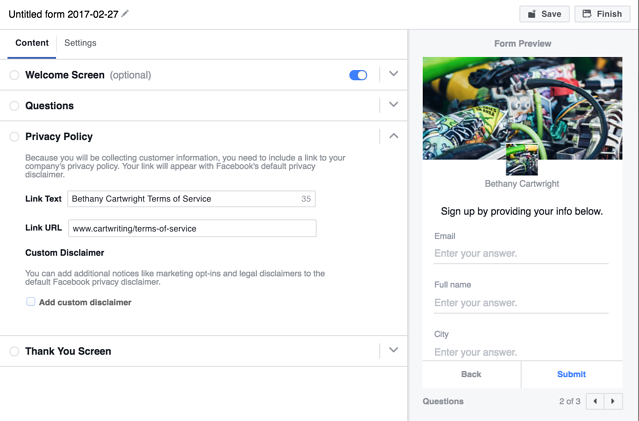 Facebook lead ads are also designed with the user in mind; when a user clicks on a lead ad, Facebook creates an auto-fill form with information the user has already submitted to Facebook. The auto-fill feature makes lead ads especially helpful for mobile users, who experience the most friction from the traditional conversion path. Convinced? Time to get your first lead ad setup. An image/creative asset to make your ad stand out on a user's newsfeed. Not sure which to use? 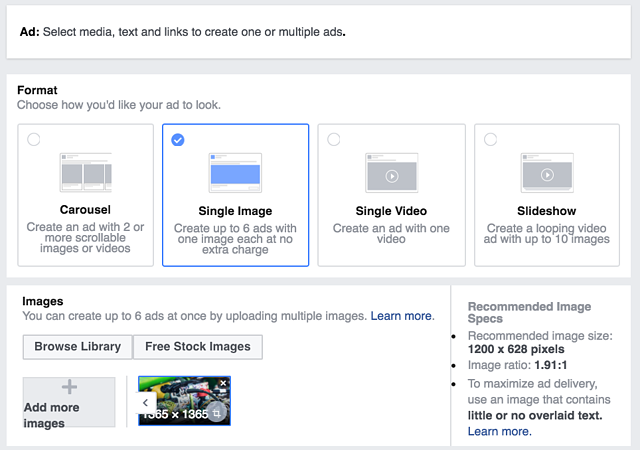 The ads manager is Facebook's classic ad tool for basic advertisers. If you're just starting out, the ads manager is probably the tool you should use. On the other hand, the power editor is Facebook's more advanced tool for advertisers who are regularly creating numerous ad campaigns in bulk. It has some more advanced features and allows you to create more ads in bulk. This tool is ideal for someone with a high budget at an enterprise level. 1) If you're using the Ads Manager, Click "Create Ad" in the top right. If you're using the power editor, Click "Create Campaign" in the top left. 3) Name your ad campaign. 4) Next, set the details of your account (Country, Timezone, Ad Unit Currency). This step is part of setting up the ads account for your business, not for the actual ad you're setting up. We'll get to the ad setup in a bit. 5) Choose your business page from the drop-down menu and read through and "Accept the Facebook Lead Ads Terms and Conditions". 6) Set up the targeting settings for your ad. You can customize the target audience by location, age, gender, language, and hundreds of other target settings. As you add in more targeting features, the ticker on the right will show you the total size of the audience you're trying to reach. 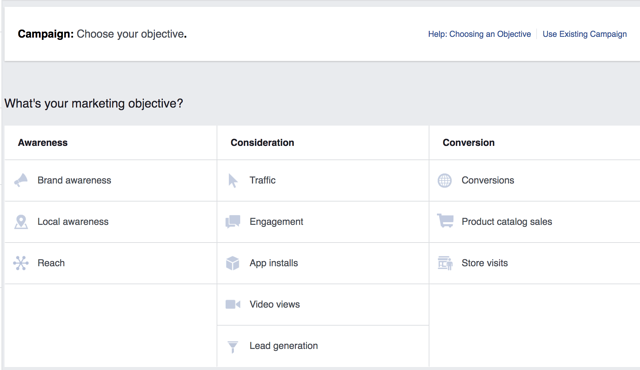 7) Next, tell Facebook whether to automatically place your ad where it's most likely to perform best, or if you'd rather customize the placement based on your own preferences. In general, it's recommended to let Facebook place your ads automatically. 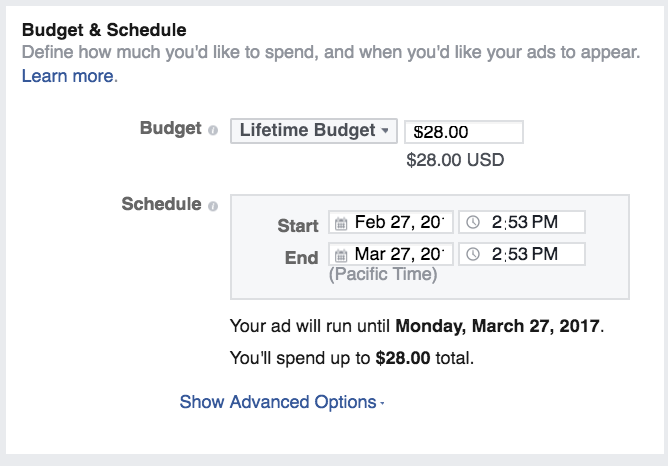 8) Next, customize your budget for the ad. Determine with your team how much budget you're willing to spend for one ad. Facebook ads works on an auction system, so choose a budget that seems reasonable based on prior research. 9) Choose an ad layout format from the options on the next screen, and upload creative assets to your ad to make it stand out. Don't forget to test different creative options and layouts to figure out what performs best over time. 10) Now it's time to set up and customize the form for your lead ad. First, customize the headline, text, and CTA for the display page of the ad. Be as specific as possible so the user knows what they will get by clicking on the CTA of your ad. 11) Next, choose which information you want to collect from from your leads on the "questions" tab. Only ask necessary questions for your funnel; the more questions you ask, the lower your click-through rate is likely to be. One benefit of lead ads is that they're completely customizable. Not only can you request common form fields such as name, phone number, and email address, you can also ask an open-ended questions such as, "what kinds of information do you find valuable?" 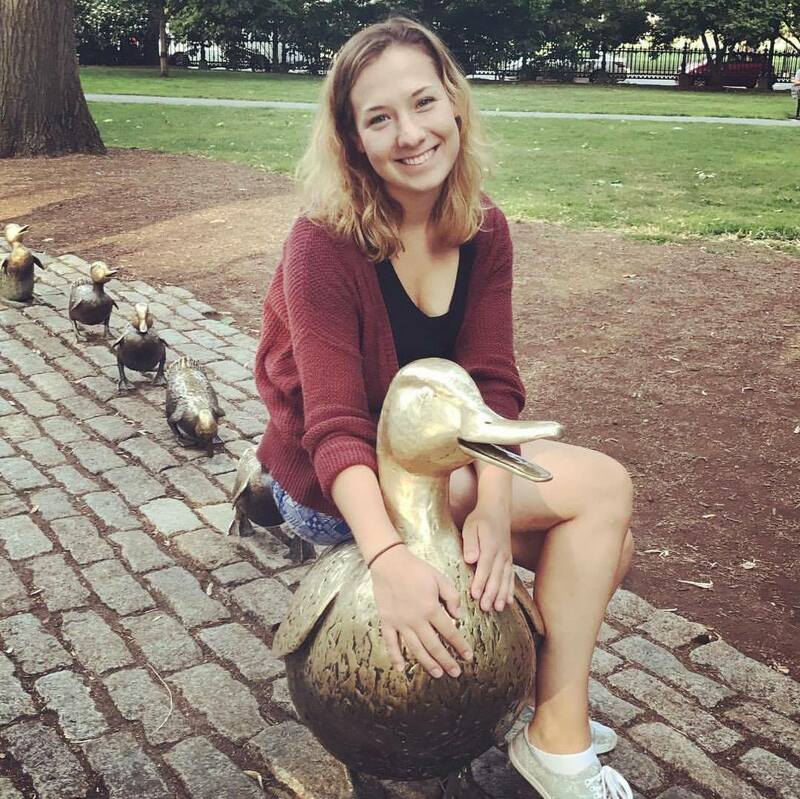 While an open-ended question might not be best for all forms, you can use an open-ended question to qualify the submissions you do receive on your lead ad form. 13) Finally, you're ready to customize the Thank You Screen. Insert your website link in this option so the user can visit your site after submitting the form. 14) Check the completed ad to make sure all of your work looks like it should. Don't ever forget to double check and proofread your work! 15) Click "finish" to complete your form. Optionally, you can "select a CRM" to collect submission information in the Leads Setup section. 16) The final step is to click the "Place Order" button. Now that you know how to set up your lead ad, you might be wondering how to actually drive conversions. After all, you'll be competing not only for a spot on a user's Facebook newsfeed but also for the attention among all the other content the targeted user is scrolling through. Because your competing against all the other pieces of content on a user's newsfeed, it's important that your ad is visually appealing. Make creative assets that are colorful, bold, and/or interesting in some way. 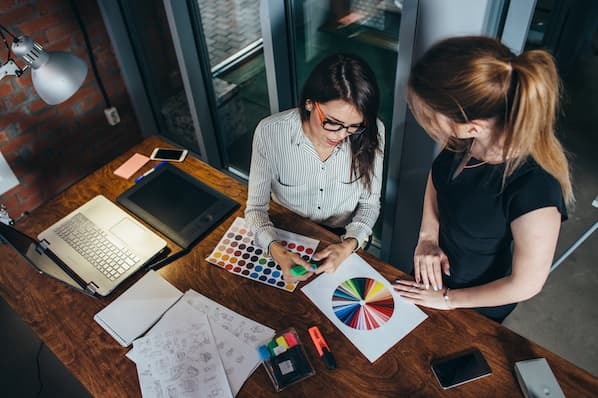 While there are plenty of ways you can make a visually appealing ad, don't just find the brightest, most colorful image and plop it on your ad. Whatever creative assets you use should accurately illustrate what you're offering through the ad. 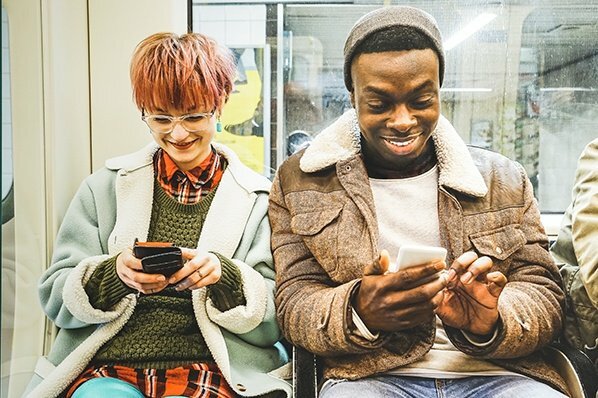 As you experiment with Facebook Ads, test out the success of different types of creative assets, and find out what works best for your target audience. Try testing videos, GIFs, and other types of images. Overtime, track the click-through and conversion rates of different creative types to optimize your ads strategy for the future. The copy of your ad should have a clear message to your audience. When writing copy, write it so that your target audience can easily understand what you're offering, why it's relevant to them, and why they should request more information now. Because your goal is to get someone to submit information right then and there, be sure to add urgency to your ad. Don't just say "Learn More" and hope for the best. Instead, include an offer with an expiration date so the user feels compelled to download or sign up for the offer now. If you're retargeting users who have previously been to your site, add context to the copy to remind them why they visited your site in the first place and how your company's offers can help them. 3) Include a clear call-to-action. Part of writing compelling copy is making sure the call-to-action is clear and prominent. You can't just use a Facebook Ad to tell your target audience what you company is and expect them to click a button to "Learn More" without giving them a clear value offer. What will they get from you when they fill out information? Offer your audience something they can't refuse. Whether you're offering an event, discount, content offering, subscription, etc, make sure the audience knows what they will get when they "Sign Up," "Learn More," "Download," etc. A key piece of creating successful Facebook Ads is targeting people that are actually going to be the most interested in what you have to offer. 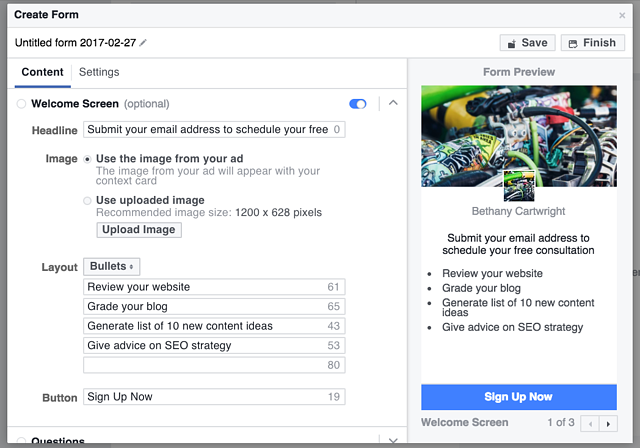 Don't spray and pray, instead, spend your ad budget most effectively by learning to get the most out of Facebook's targeting features. 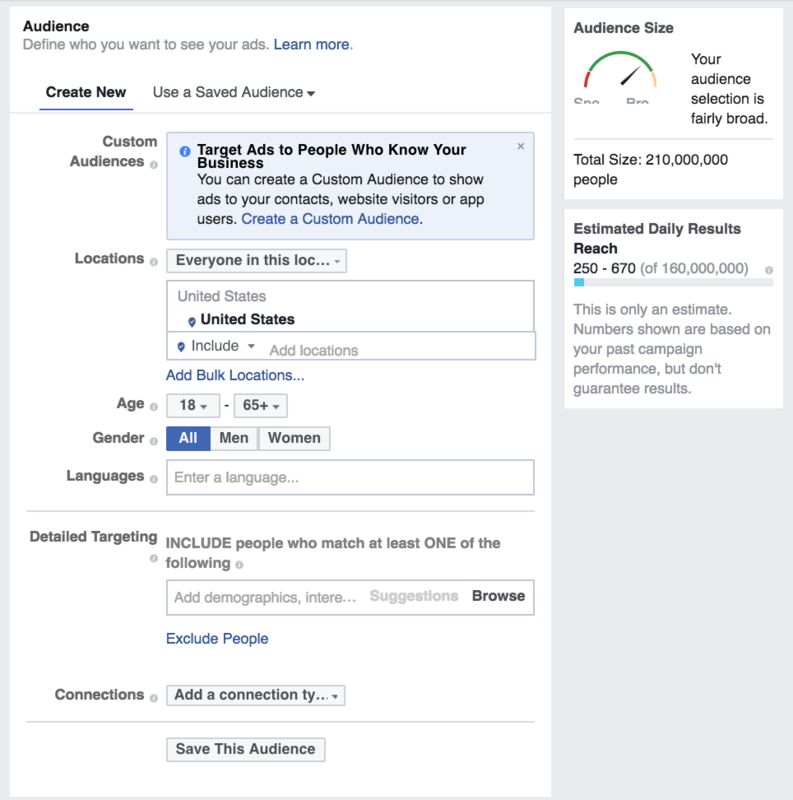 In general, your goal with Facebook Ads should be to reach new audiences. However, because you're also trying to collect lead information on the spot, it's also important not to ask for too much to soon. That's why lead ads are especially useful in retargeting campaigns. Use tracking pixels on your website to find out who is visiting your website but not converting, and use lead ads to nurture them back into you ecosystem. This blog post didn't cover a full picture of Facebook Ads targeting strategy, but luckily, we created a free guide to walk you through it. Want more information on how to target users effectively? 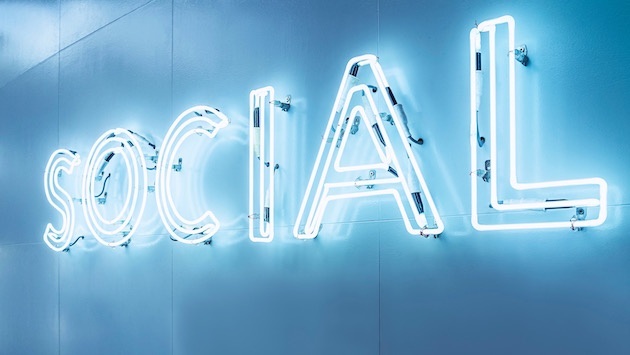 Check out our full guide -- it includes additional lead generation and social media tips as well!